Shasta Lake Creative Community Origins and Action — Heritage Roasting Co.
Hey everyone, it’s Hannah Townley! - Im the Creative Community Coordinator for the Shasta Lake Creative Community. Some of you may see my name all over facebook as I spam you with event after event that both the Creative Community and Heritage are doing in an effort to heal and revitalize the town of Shasta Lake. After that I want to talk about how you can jump on board with this awesome group that’s seeing to it that Shasta Lake thrives! I was born and raised in Shasta Lake and attended Toyon Elementary School. I can remember all too well those school days we ended up on lock down because a mountain lion wandered onto school property… and I remember those super fun field trips we took to the caverns and the Dam just down the road. Me getting my photo taken at Toyon Elementary School after receiving an Art Award. In my middle school years I ended up bouncing between homeschool and Shasta Lake Middle School - not really finding my fit. However, I do remember fondly being in Art Class and Leadership class with Mrs Park - feeling empowered creatively. And finding some genuine love from my Math Teacher, Mrs Newman, even though I was basically failing her class. After entering High school I spent a short amount of time at Central Valley before going back into homeschool for the rest of my high school years. During this time I was not around much of my peers nor was I involved in the community what so ever. In fact, my family was not into even attending community events. I don't think I ever went to the Boomtown Festival or the Veterans Day Parade until maybe 4 or 5 years ago? I ended up getting a job at a group home based in Shasta Lake and worked there for a few years - all the while meeting and getting married to who is now my husband, Aaron Townley. We eventually packed up our bags and began seasonal work in Alaska. After our first summer working up in Alaska and before coming back to California, we decided that we no longer wanted to live in Shasta Lake. We began to search for a home in Oregon. However, every attempt at searching for a home was met with problems…either we got lost or the realtor wouldn't meet with us. One trip resulted in our car breaking down and having it towed all the way back to California. During this time we were becoming regulars at Heritage and were getting to know the great people that worked there. Soon the summer rolled around again and we were back in Alaska. Unexpectedly, it was super painful for us to leave the friends we had made at Heritage…so upon coming back I knew I wanted to be a part of this place that was teaching me to ‘Love Where I Live‘ in a way I never had before - community. Up until that time I had only ever been told that Shasta Lake was a place you wanted to get away from - that there was nothing here for me. I was starting to believe it until Heritage convinced me otherwise. Soon I realized, I don't have to move where the grass MAY be greener on the other side but instead I can help positively change my community into one I want to live in and raise my children in. After asking Stu and Sara for a job(and literally spending 3-6 hours at a time, 3-5 days a week at Heritage) they agreed to hire me. I’ve now worked for Heritage a little over 3 years and I’m happy to report, Shasta Lake IS my home and I love where I live. About a year after working for Heritage I started this crazy thing called, ‘Shasta Lake Creative Community‘ because as a person who completely operates as a creative, I understood how much art can change a town. Through art you can cast vision, you can give hope to people that have none. A photo from Shasta Lake Creative Communities first ever event, ‘Celebrate Shasta Lake‘ which was a Swing Dance Night and Guest-Judged Art Competition. It was super successful and fun all day event! Some people that are wired completely different then me can't imagine a better tomorrow but if they are given a tangible view of what could be, they start to experience hope. It is our goal with the Shasta Lake Creative Community to do just that. To be a beacon in a town where our youth are being told Shasta Lake is a place you don't want to live - offering them empowerment to be a part of the change. To stimulate economic growth and opportunities as entrepreneurs see the value in what our great town could be! To create more events that enrich our town and give our residents opportunities to creatively express themselves! We want locals to learn how to Love Where They Live. When you love something, you want whats best for it - you want to see it thrive. As we look a head on this new year, we are super excited to offer opportunities for people to get more involved in the Shasta Lake Creative Community. With dreams so big we need a team of people that love Shasta Lake just as much as we do. Currently, there are 3 major way you can get involved! 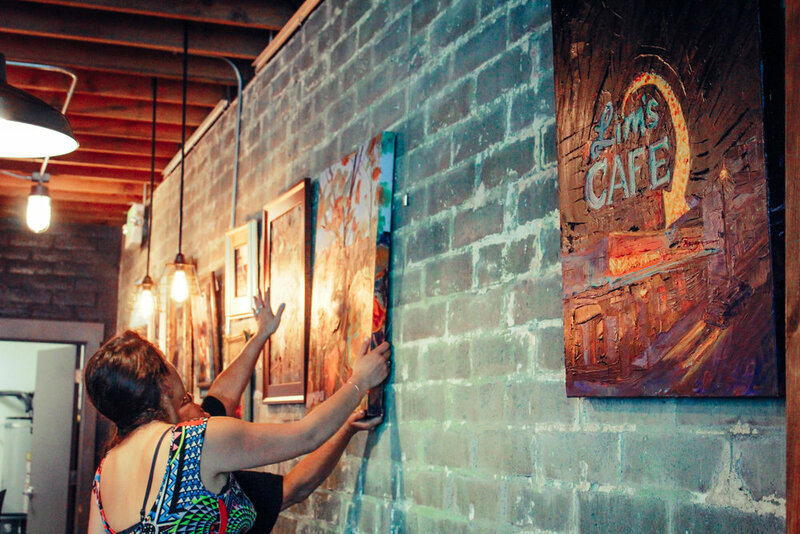 We have a monthly Art Rotation in the Heritage Coffee House featuring one local artist each month! We are super excited to bring together Artists to do some pretty amazing things in Shasta Lake this year. One thing I know we are planning on doing in 2019 is an Art Walk - to do something of this scale, we need to grow our Art Team. We have multiple ways a person could be on our Art Team - learn more here! Photo of the Shasta Lake Farmers Market earlier in the season! In 2018, we launched a Certified Farmers Market in Shasta Lake! Despite the set back we experienced from the fires and it being our first year - we did witness great support from both vendors and our community. We are seeking members in the community that would like to see this Certified Farmers Market and Town Celebration thrive! For us to come back stronger in 2019, we’ve recognized the need to build up our Market Team to see that tasks get completed well! There is many ways you could be a part of our Market Team - learn more here! Heritage Roasting Co, is the cool way we get to connect with people and build relationship over coffee. We are a Non-Profit under Heritage Missional Community. Missional Community is a way to say we are activated out of the hope we have received from our relationship with Christ and want others to experience that same hope. This new expression of Church is all about moving at the pace of relationship and desiring to experience authenticity that leads to healing and a life of more! Inside Heritage Missional Community, there are multiple Missional Communities that gather. As a Missional Community you do life together, grow together, play together, and do community work together -all under a specific focus! Currently we have a Worship Missional Community and a Prayer Missional Community that gathers weekly. We are looking to launch a Creative Missional Community that would also meet weekly! Through the Creative Missional Community we would do art together, learn about how we serve a creative God, be boots on the ground for events hosted through the Shasta Lake Creative Community, and more. We haven't yet planned when we will meet but would love to invite you to come to Heritage on Sunday evenings(6:30PM - 8:30PM) for Celebration if your interested in being a part of this Creative Missional Community. Photo from Celebration, our weekly Sunday evening gathering. I am technically on Maternity Leave(42 Weeks Pregnant TOMORROW 0.0) - but as soon we can, we will be planning and releasing meeting dates for those interested in joining the Art Team, Market Team, and when we will be launching our Creative Missional Community!